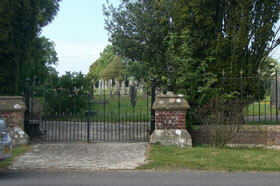 Charminster Cemetery is located in Weir View, Charminster. The land was purchased for burials in 1896. The original cemetery was around 5,600sq.m. 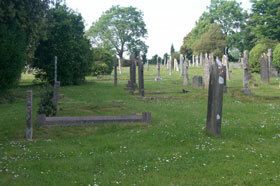 During the 1990’s as the cemetery was approaching capacity part of the adjacent allotments to the west was purchased adding a further area of around 2,000sq.m. This new area is currently used for burials and interment of ashes. Where a marble or other stone vase is sited in lieu of a headstone, the vase must be in line with existing headstones. Only the standard pattern of flower holder is to be used. It is to be installed with the top of the holder just below ground level. The applicant is responsible for the purchase of the holder which can be obtained from a Funeral Director or monumental mason. Holders other than those incorporate in the headstone, must be set within 10cm of the front of the headstone (or stone vase) and if more than one holder, not to exceed a total of 60cm in width. Flowers placed in the holders must be removed when they have died and be placed in the wheelie bin provided in the cemetery. Wreaths, sprays or other dead flowers or faded artificial flowers can be removed at the discretion of the groundsman. No items, other than mentioned above, shall be placed on the grave. Wreaths and other floral tributes may be placed on the grave at the time of internment. The wreaths and floral tributes should be removed when the flowers have died and placed in the wheelie bin provided, otherwise they will be removed at the discretion of the groundsman.